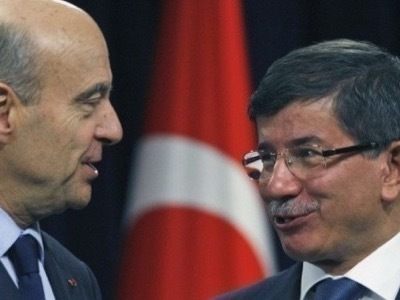 Featured image: In 2011, Alain Juppe for France and Ahmet Davutoğlu for Turkey secretly agreed to implement the creation of a pseudo-Kurdistan and a Sunnistan straddling the borders between Iraq and Syria (this was to be Daesh’s job) in order to create a destination for the exile of the Turkish Kurds. Their project was supported by Israël and the United Kingdom. Thierry Meyssan describes the secret conflict which, for the last five years, has haunted the relations between the European Union, France and Turkey. Just after the death of the founder of Turkish Islamism, Necmettin Erbakan, and at the beginning of the «Arab Spring», the Erdoğan government concluded a secret agreement with France. According to a diplomat who has studied the document, it stipulated the conditions for the participation of Turkey in the wars against Libya (which had just started) and against Syria (which was to follow). France, represented by its Minister for Foreign Affairs, Alain Juppé, agreed in particular to deal with the «Kurdish question» without «compromising the integrity of Turkish territory» – a convoluted formula which signified that a pseudo-Kurdistan would be created elsewhere, to which the members of the PKK would be exiled. This project for ethnic cleansing, which is not new, had until that time been evoked only in Israëli military literature describing the new state between Syria and Iraq. On the 31 st October 2014, François Hollande accompanies Recep Tayyip Erdoğan on the steps of the Elysée. Another guest had just left discretely by the back door, Kurdish leader Salih Muslim. 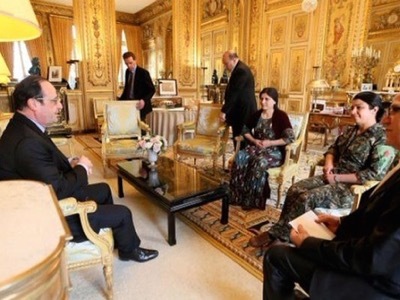 On the 31st October 2014, President François Hollande took the opportunity of an official visit by Recep Tayyip Erdoğan to Paris to organise a secret meeting, at the Elysée, with the co-President of the Syrian Kurds, Salih Muslim. Betraying the Turkish Kurds and their leader Abdullah Öcalan, Salih Muslim agreed to become the President of this pseudo-Kurdistan which was to be created on the occasion of the overthrow of democratically elected President Bachar el-Assad. This was during the battle of Kobane. For several months, the Syrian Kurds had been defending the city against Daesh. Their victory over the jihadists was to shake up the political chessboard – anyone who really wanted to fight the jihadists had to ally themselves with the Kurds. However, the Syrian Kurds only obtained their nationality at the beginning of the war – until then, they had been Turkish political refugees in Syria, chased from their country during the repression of the 1980’s. At that time, the member states of NATO considered the PKK, the main Kurdish formation in Turkey, as a terrorist organisation. But from then on, they would distinguish between the ’bad’ Turkish PKK and the ’good’ Syrian YPG, despite the fact that these two organisations are closely related. After the battle of Kobane, François Hollande changed sides and expressed his support for the Kurds, when he received a delegation of the YPG at the Elysée, on the 8th February 2015 . A dramatic turn of events – on the 8th February 2015, France changed its previous position. 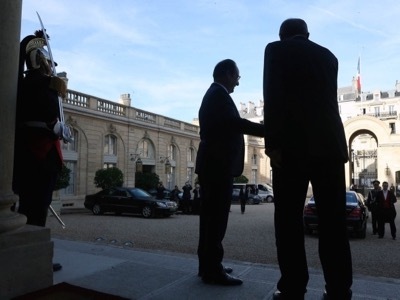 Officially this time, François Hollande received at the Elysée the co-President of the Syrian Kurds (loyal to Öcalan), Asya Abdullah, and Commander Nesrin Abdullah in camouflage uniform. Salih Muslim was absent from this meeting. Recep Tayyip Erdoğan reacted by ordering an attack by Daesh, in Suruç, against a pro-Kurd demonstration, on the 20th July2015. Using Western anti-terrorist rhetoric, he declared war this time against Daesh and the Kurds, but used military means only against the Kurds. By doing so, he put an end to the cease-fire and re-started the civil war in his own country. Unable to create a pseudo-Kurdistan in Syria, he provoked the exodus of Kurds to Europe. On the 3rd September 2015, the publication of a photograph of a drowned Kurdish child marked the start of a huge wave of migration from Turkey to the European Union, mainly to Germany. During the first weeks, the German leaders were delighted with this massive influx of new workers, badly needed by their heavy industry, while the media expressed their compassion for the refugees who were fleeing the Syrian dictatorship. Furthermore, on the 29th September, the French and German leaders hijacked the empathy for the migrants in order to study the possibility of financing the continuation of the war by giving 3 billion Euros to Turkey – a gift which was presented to public opinion as humanitarian aid for the refugees. At the end of September 2015, Russia began its military operation against jihadists of all stripes, and Recep Tayyip Erdoğan was compelled to watch the progressive failure of his project. He therefore ordered Salih Muslim to launch an operation for the forced Kurdisation of Northern Syria. The Kurdish brigades expelled the Arab and Assyrian teachers from their schools and replaced them with Kurdish teachers. The Syrians revolted and reached out to the Russians, who found a way to calm the situation, not without evoking a possible ulterior federalisation of Syria. There was no reaction from France. On the 13th November, Turkey, exasperated by François Hollande’s about-turns, took France hostage and ordered the attacks in Paris, causing 130 dead and 413 wounded. «Successive French governments have formed alliances with states whose values are opposed to those of the Republic. They have progressively opted for waging secret wars for these states, before changing their minds. President Hollande, and in particular his Head of Staff, General Benoit Puga, his Minister for Foreign Affairs, Laurent Fabius and his predecessor Alain Juppé, are today the object of blackmail from which they can only escape by revealing the mess into which they have dragged their country.» . Terrorised, Paris hastily resorted to the Juppé plan of 2011. With London, they caused the adoption, on the 20th November, of Resolution 2249 by the Security Council. Under cover of the fight against Daesh, the Resolution was intended to justify the conquest of Northern Syria in order to create, at last, the pseudo-Kurdistan to which Recep Tayyip Erdoğan could expel «his» Kurds. But the United States and Russia had the text altered in such a way that France and the United Kingdom would not be able to intervene without being invited by Syria – a situation which raises echoes of the failed colonial operation of 1956, in which Franco-British troops attempted to occupy the Suez Canal with the support of Israël and Turkey, but had to withdraw under the glares of the United States and the USSR. During the five and a half months of the Russian intervention in Syria, Turko-Russian relations continually worsened. The attack against the Metrojet Flight 9268 in the Sinaï, Vladimir Putin’s accusations at the G20 summit in Antalya, the destruction of the Sukhoï-24 and Russian sanctions against Turkey, the publication of the aerial photographs of the interminable line of tanker-trucks carrying oil stolen by Daeash through Turkey, etc. After having considered declaring war on Turkey, Russia finally decided on the subtler plan of supporting the PKK against the Erdoğan administration. Sergeï Lavrov managed to convince his US partner to profit from the coming destabilisation of Turkey by organising the overthrow of the dictator Erdoğan. The Turkish régime, which feels threatened by both Russia and the USA, is attempting to find allies. Prime Minister Ahmet Davutoğlu went to Tehran on the 5th March, while the Iranian Minister for Foreign Affairs, Mohammad Javad Zarif, visited Ankara on the 18th March. But the Islamic Republic has no intention of causing trouble with the two great powers. On the 14th March, Vladimir Putin announced the withdrawal of Russian bombers, at which point the pseudo-Kurdistan project once again became possible. But Moscow and Washington were one step ahead – they began to deliver, indirectly, weapons to the PKK. Unfortunately, this time it was the European Union which no longer wanted to hear about the colonisation of Northern Syria. The majority of EU member states have followed the foreign policy imposed by Paris for the last five years, with a remarkable absence of success. In order to signal their annoyance, several states, including Belgium, offered political asylum to leaders of the Turkish Kurds. They expressed their anger during the EU-Turkey summit of the 17th and 18th March, during which they were obliged to adopt definitively the subsidy of 3 billion Euros per year to Ankara. On that occasion, I denounced the behaviour of the European elite, who, blinded by their anti-Syrian obsession, were reproducing the same error that was committed in 1938. At that time, obsessed by their anti-communism, they supported Chancellor Hitler during the annexation of Austria and the Sudeten crisis (Munich agreements), without realising that they were arming the enemy which was about to strike them . «There is no reason that the bomb which exploded in Ankara might not explode in Brussels or another European city (…) Here I am appealing to all states who open their arms and who, directly or indirectly, support terrorist organisations. You are feeding a serpent in your bed. and this serpent that you are feeding may bite you at any moment. Perhaps looking at these bombs which explode in Turkey on your television screens means nothing to you – but when the bombs begin exploding in your cities, you will certainly understand what we are feeling. But then it will be too late. Stop supporting these activities which you would never tolerate in your own countries, except when they are aimed at Turkey. » . Four days later, the attacks occurred in Brussels, causing 34 dead and 260 wounded. and so that we would not think it was a coincidence, but a deliberate act, on the following day the Turkish Press rejoiced at the punishment inflicted upon Belgium . Since President Erdoğan re-started the civil war, it has cost 3,500 lives in Turkey. Thierry Meyssan is a French intellectual, founder and chairman of Voltaire Network and the Axis for Peace Conference.